Organised CC in Britain dates back to 1824 with the famous London-Edinburgh postal match. A boom in inter-club matches followed and the latter half of the 19th century saw private individual matches becoming commonplace and the first organised CC tournaments, mainly run by newspapers or journals. 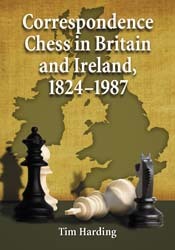 1906 saw the formation of the BCCA (British Correspondence Chess Association) which is now the oldest continuous CC organisation in the world. On behalf of the British Chess Federation (BCF), the BCCA organised the first British CC Championships (1920) and the BCF itself organised the Counties & District CC Championships (1922). Both tournaments are still going strong today. However, Britain is unusual in that it does not consist of just one CC organisation but has several different bodies. As well as the BCCA, there is the National Correspondence Chess Club (NatCorr) formed 1932 and still going; the Social Correspondence Chess Association, formed 1941and still going; the Postal Chess Club (1943 – 1991), the British Correspondence Chess Society (BCCS 1962 – 2010) and other smaller bodies. 1962 saw the formation of the British Postal Chess Federation (BPCF) to oversee the running of the British CC Championships and provide a united body to deal with international affairs. The newly formed federation duly affiliated to the ICCF and England have been members ever since. Scotland and Wales had formed their own CC federations in the late 1970’s, gaining partial membership of ICCF in 1981 and full ICCF memberships in 1991, whereas BPCF has represented England internationally with ICCF. The name was changed to the BFCC (British Federation for Correspondence Chess) in 1999 to reflect the fact that CC was no longer postal only. Although the BFCC represents England only, the federation continues to assist players from Wales (whose federation is now defunct) and Northern Ireland when required. Over the period, English CC has been adorned by two truly outstanding players. CC and FIDE GM Dr. Jonathan Penrose won the OTB British Championship many consecutive times before concentrating his chess attentions on CC. He took 3rd place in the 13th World CC Final and was ranked 2nd in the world at the top of his game. CC-GM Keith Richardson was the first British player to receive a recognised GM Title for playing chess when he finished 3rd in the 7th World Championship Final and he repeated this performance in the 10th Final. In modern times, England’s outstanding player is CC-GM Richard Hall. He is currently the BFCC President. In the Heemsoth Memorial (2008-10) which was one of the strongest CC tournaments of all time, Richard finished on the same points as the winner, although 3rd on tie-break. Richard is playing in the 25th ICCF World Championship final along with another English GM, Dr Ian Brooks. It is hoped a world title will eventually find its way to our shores! Great Britain won the Gold Medal in Olympiad IX and thereafter the same team followed up to gain the Silver Medal in Olympiad X representing England. Since those heady heights, the England team have not reached the medal podium. The BFCC remains proud of the numerous tournaments they have organised allowing Title opportunities not just for English players, but also for players from all over the world. The tradition started in 1974 with the very strong Reg Potter Memorial (there is a book on the tournament edited by Ken Messere); the BFCC-25 followed in 1987 and then the Reg Gillman memorial tournaments starting in 1999. In the same year, England also organised World Cup XI which only finished in 2010! Other tournaments organised include 1st North Sea Team Tournament and the 5th North Atlantic Team tournament. Another 16 Memorial tournaments for various players and organisers have also taken place including the prestigious category XV Simon Webb Memorial. The next milestone tournament to take place will be to mark the celebration of BFCC’s Golden Jubilee in 2012. Here is a win by current BFCC President Richard Hall against former World Champion Tunc Hamarat.